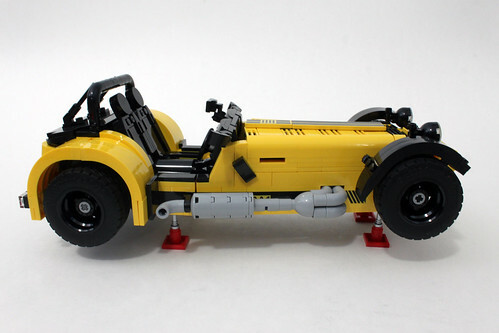 It was December 4, 2014 when Carl Greatrix submitted his Caterham Super Seven project on LEGO Ideas. 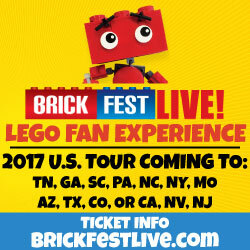 Fast forward to May 2015 when the project hit 10,000 supporters and was approved to become an official LEGO Ideas set a year later. 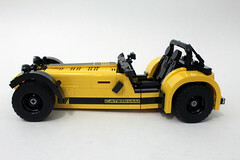 The Caterham Seven 620R (21307) was announced last week and the folks over at LEGO has sent us a review copy of the set. 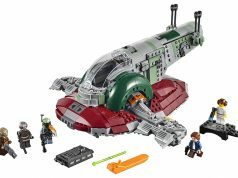 Coming at 771 pieces and retailing for $79.99, it is the largest Ideas set in terms of piece count as well as being the most expensive one to be released so far. 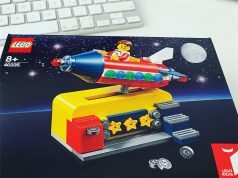 The contents of the box include six numbered bags and the instruction booklet. 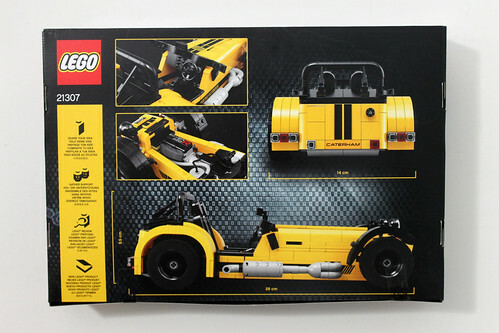 I’m not sure how LEGO decides what stock of paper to use for the instructions but for the Caterham Seven 620R, it uses the normal, non-thick kind. 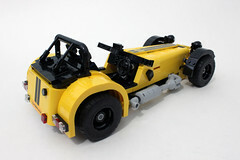 The first couple of pages gives a brief description of the Caterham Seven as well some of the parts you’ll be building. The back of the instructions give some thoughts from Carl Greatrix and from designer Henrik Andersen about the set. 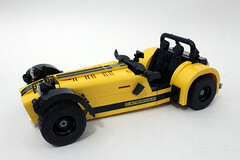 The build of the Caterham Seven 620R starts with the base of the car using a variety of Technic parts. 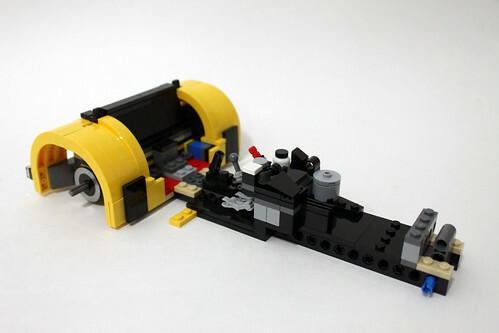 There’s nothing too complicated about this part of the build and you can already start seeing the car shape up. At step 25, you get some printed disc brakes for the rear wheels. Toward the end of the first bags, you’ll already have created the rear fenders using some nice SNOT techniques. 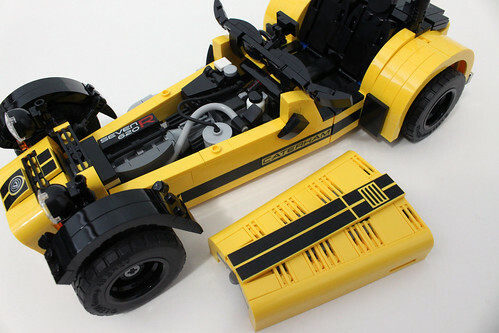 Right at the beginning of the second set of bags, you’ll be building the supercharged 2.0 litre engine which makes nice use of some revolvers as part of the engine exhaust system. 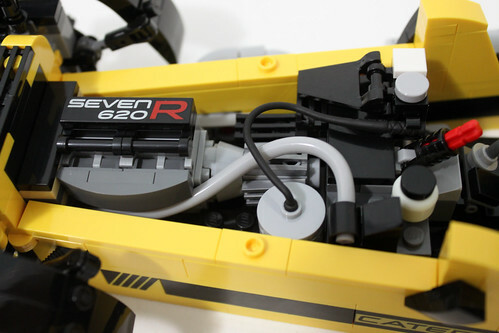 You’ll also see some little details put in like the printed Seven 620R tile and other fluid containers. There’s also a black whip thrown in for even more pipe detailing. 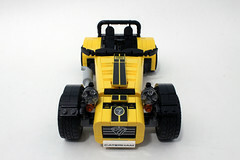 On the right side of the car, you have the side exit exhaust system which uses some new light-bluish gray curved pieces. The ones in the front are held on using some lipstick pieces which was a very interesting use of parts. Furtheralong, you have the two black carbon fiber seats that are able to fold down slightly. They use more SNOT building to give them the smooth sides and round top. 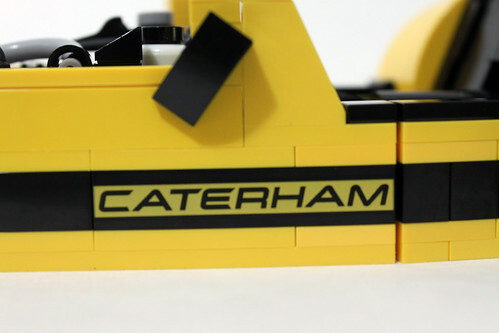 You also have the sides of the car with some printed detailing including the Caterham logo on both sides along with some bricks with stripes near the front. Here’s where you’ll definitely see the car’s form with the v-shape. 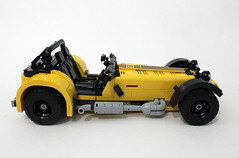 At the end, you build up the front fenders and headlights. 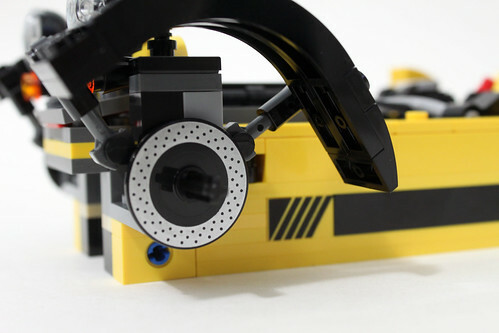 Again, LEGO has provided two more printed disc brakes for the front wheels. 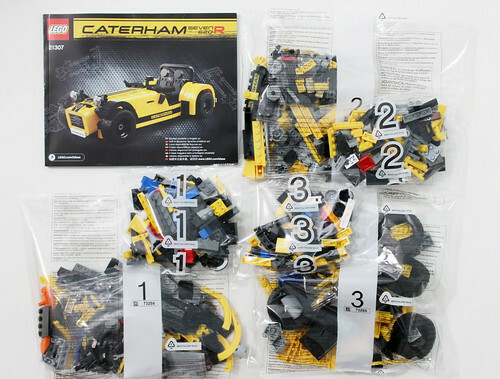 For the last set of bags, you start by building the nose cone for the Caterham Seven 620R. As with pretty much like the rest of the car, it uses SNOT building to achieve its look. 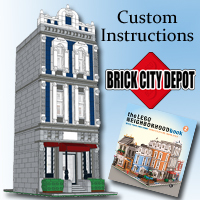 It is situated on a hinge in the front to give it the angled appearance. 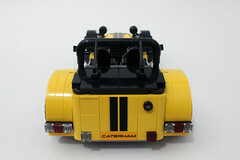 In the front, you have a 2×4 printed tile for the Caterham 7 logo as well as a printed 1×4 tile for the Caterham license plate. Next up is the hood. There are two sides to it which are similar for the most part. They’re connected together using a hinges plates and those are covered up with tiles. On the top, there are more printed tiles for the stripe design. The entire hood just goes over the engine and it fits in snug on a couple of jumper plates. The dashboard area is built next and note that it is a right-hand drive. There are some gauges behind the steering wheel and you also some clips in the middle to represent various switches the car has. Finally you have the rear-view mirror at the top and the side mirrors on either side. 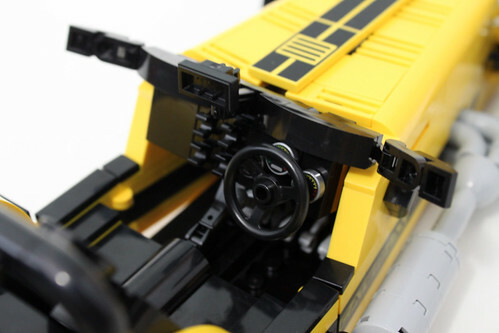 The whole dashboard is attached to a Technic pin. It may feel a little wobbly but it’s fairly secure. 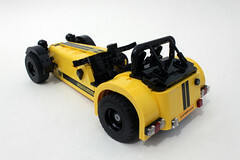 Lastly, you have have the rollbar and the rear bumper. The bumper has your usual tail lights and such but it also has another printed tile for the license plate. Going over the bumper is the removable boot cover at the back of the car. 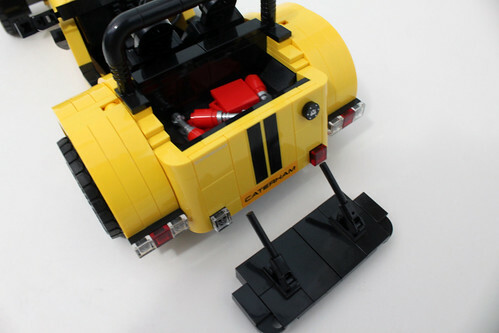 There’s a little compartment where you can put the four axle stands and they fit comfortably with the cover on. 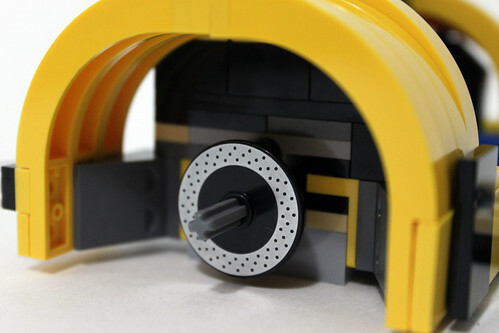 The wheel are pretty normal and are held on by some Technic connectors. 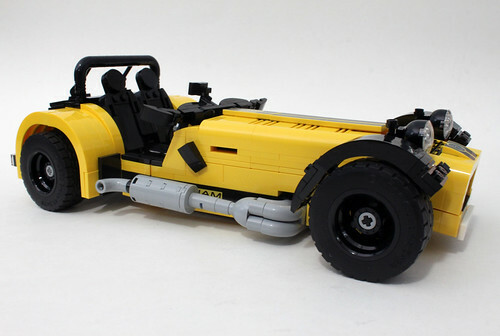 Overall, the LEGO Ideas Caterham Seven 620R (21307) has really stepped up the game in terms of producing a high quality set that started out as a project that a fan posted on LEGO Ideas. 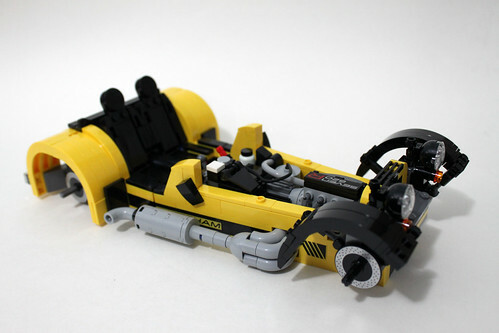 The amount of detail the car has is spectacular and I and probably a majority of fans appreciate the printed parts the set has. 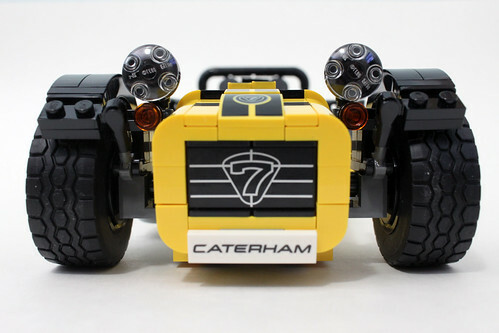 The design of the Caterham is spot-on and I don’t really have any complaints about it. 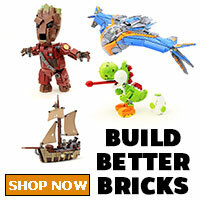 I do like the whole studless form factor and the actual size of the finished build. 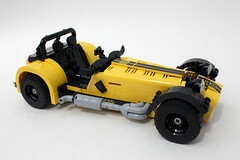 It is comparable to the size of some of the LEGO Creator sets like the Ferrari F40 (10248) and Volkswagen Beetle (10252) . 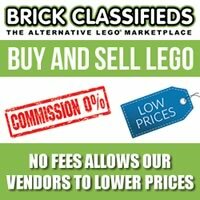 It makes a great display piece although that doesn’t have to be said. 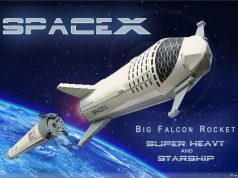 If you’re looking at it from afar, you might even mistake it for a diecast or a model kit. 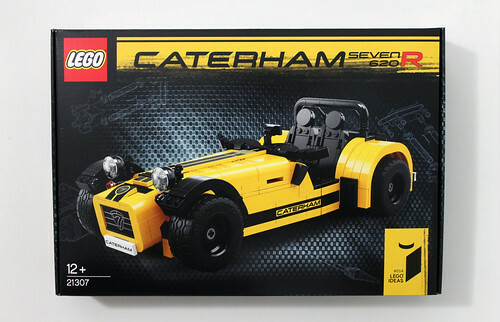 Again, the LEGO Ideas Caterham Seven 620R (21307) will be available starting on October 1 for $79.99 but I’m reading that it might already be on shelves at Toys R Us.